The Wolf-revered, feared, misunderstood, iconic figure of mystery, ultimate survivor. As wolf populations continue to grow and reclaim portions of their historic range in many parts of the world, key questions about our role in their future must be answered. How might we respond to increasing contacts with wolves? Given the historic and current polarizing atmosphere, how can we educate and dialogue with each other about our values and their role in the wolf’s future? What new information about wolf ecology, behavior and management can help guide us in making sound decisions? The International Wolf Center is calling educators, wolf enthusiasts and conservation professionals to come together to learn and respond to the evolving social and biological realities of wolves and humans at the crossroads. More information. The International Wolf Conference, which will be held between 25-27 September in Postojna, Slovenia. The Conference is supported and organized by EU LIFE+ and SloWolf (University of Ljubljana). The presence of wolves in human-dominated landscapes of Europe is a result of complex interactions among many environmental and human factors. With ever increasing human pressure on the environment, the challenge of effective conservation of wolves can only be met through understanding of how interactions of different factors in these landscapes either allow or limit occurrence and persistence of this species. By sharing knowledge and experiences, we can considerably increase effectiveness of wolf conservation, improve cooperation, and promote transition from country-based management towards management at the level of populations. The target audience of the conference are wolf researchers, experts and managers, as well as students with interests in wildlife management and conservation. The first two days will be devoted to presentations and workshops dealing with major wolf conservation topics, and the last day to a fieldtrip to Slovenian wolf habitat. Sad statistics from the Amur! February 25th 2012 – a 6-month-old young tigress named Cinderella was found barely alive in Primorye. At the moment, she is kept at the rehabilitation centre and is being prepared for return back to the wild. March 17th 2012 – a male tiger cub supposedly from the same litter with the tigress Cinderella was found extremely undernourished. Despite all attempts by veterinarians, the animal died. April 10th 2012 – Primorsky police searched the home and office of a well-known local businessman, Evgeny Romanov, and found a large number of skins and derivatives of wild animals including 148 bear paws, two Asiatic black bear skins, three brown bear skins, two skins and five tails of Amur tiger, and five dead sea eagles. April 17th 2012 – customs officers in Primorsky Province in Russia’s Far East have arrested a Chinese woman as she attempted to smuggle three Amur tiger paws across the border into China. After an investigation into the origin of the paws, it was found that they were from two different tigers. April 21st 2012 – a male tiger dubbed Gryazny (Dirty) was found washed ashore dead. August 24th 2012 – eight Amur tiger skins were seized from a resident of Arseniev town in Primorsky krai. On December 2-3 and December 6, 2012 three orphaned tiger cubs were found in Yakovlevsky district of Primorye and transported to the rehabilitation centre near Alekseevka village. On January 10-11, 2013 – a 6-month-old tiger cub was found with a traumatized paw near Svetlogorye village, and now the animal is kept at Utyos Wildlife Rehabilitation Centre in Khabarovsky krai. January 15th 2013 – police officers discovered an Amur tiger skin illegally transported by train from Vladivostok to Khabarovsk. A train conductor was asked by a stranger to deliver a package to a man in Khabarovsk. During routine inspection, a tiger skin was found in a plastic bag. Experts believe that it was a 1.5-year-old tiger. There was a bullet hole on the skin that indicates that the animal supposedly was killed by poachers. February 5th 2013 – Primorsky police arrested a women charged with illegal trade of the remains of a tiger cub – a skull, legs and rib cage. February 14th 2013 – wildlife managers rescued a 6-month-old female tiger cub caught in a trap in Kavalerovsky district. The animal was extremely emaciated. His leg was seriously traumatized. The cub was transported to Arseniev town where it was urgently operated by veterinarians. February 17th 2013 – Ussuriisky police officers and wildlife managers arrested two residents charged with killing a 4-year-old Amur tiger. The detained suspects had killed an Amur tiger and then tried to sell its skin, bones and cartilages. February 21st 2013 – a 6-month-old male tiger cub was found in Kavalerovsky district of Primorye. February 25th 2013 – a 6-month-old tiger cub was found extremely emaciated 60 km from Svetlogorye village, Pozharsky district of Primorye. Sergei Bereznuk, Director of the Phoenix Fund: “There are no words to express our indignation. For less than one year this is the eighth tiger cub taken from the wild due to its young age and inexperience to survive on its own. We are almost 100% sure that their mothers died. And they were most probably killed by poachers. If we also add unprecedented seizures of tiger skins and bones by law enforcement officers in Primorye and Khabarovsk, one can say that we have lost a few dozens of Amur tigers in just over 12 months. And the situation can become irreparable soon because tigers gene pool has become depleted. Our State Duma spent too much time considering Kremlin chief of staff Sergey Ivanov’s initiative to turn capturing, trade and transportation of rare and endangered species into a criminal offence. That is why poachers and wildlife traffickers are trying now to preserve as many tiger skins and bones as possible. While our deputies are dealing with other problems they consider more important than the weakness of environmental laws, the Amur tiger population may become extinct. For more than two years the Phoenix Fund and Wildlife Conservation Society have been running a project aimed at improving efficiency of anti-poaching efforts with the use of Management Information System (MIST) in four protected areas in Primorye. And during these years no tigers were killed there. It seems likely that tigers are mostly killed outside of the protected areas where Hunting Management Department, a state agency of Primorsky krai administration, must provide efficient protection of these endangered cats. Unfortunately, up to date we could not convince local officials in charge of nature conservation that it is necessary to take measures to improve anti-poaching management by that agency. We are ready to assist them with MIST introduction, consult and train rangers to work with this new useful tool, but high ambitions of local officials hinder the process. We hope that these dismal facts about the loss of tigers outside protected areas will make them think over the necessity to take urgent actions. At the moment, we are collecting signatures on a petition to speed up the process of criminalizing the possession, transportation and trade of rare and endangered species“. We are glad to present site visitors with our first flyer presenting our work and passion in Rewilding the World! The design and printing of this flyer was kindly sponsored by Lucien de Groot of L Reclamo. Thank you very much Lucien! We are delighted to bring news that the RF has become a full member of the FIN, a confederation of small conservation NGOs in the Netherlands. The federation is a non-profit organization founded in 2001. 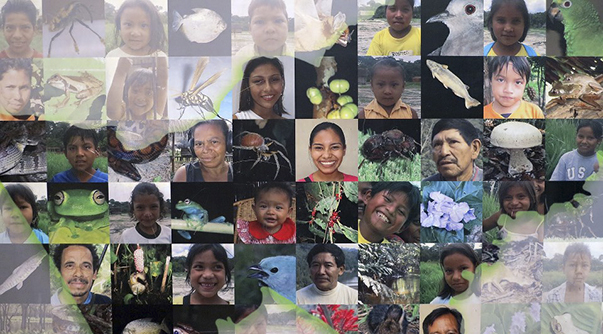 With 18 member organizations the FIN is a platform for exchange of expertise from different perspectives and approaches in international nature conservation. Members include fundraisers and operative organizations, which can support each other. Each year on World Animal Day, the 4th of October, the FIN organizes a nature conservation auction where certain projects objectives or conservation commodities are sold to the highest bidder. An excellent opportunity for fundraising. We hope this membership will pride considerable impulse to the RF and strengthen our collaborative network. We are happy to have Nuno Negrões Soares as member of our board of international advisors and as our prime connection and expert for South America, as well as an liaison officer for Bolivia! Nuno Soares is a Portugese biologist and an expert on environmental education with a passion for mammalian carnivore ecology and conservation. He is particularly keen in making effective contributions to and devising novel solutions for improving the coexistence between carnivores and people. He began this mission with research into Red fox ecology in northern Portugal. He subsequently became involved in the Portuguese census and action planning for the conservation of the Iberian lynx, one of the most highly threathened species in the World. He then worked for three years in wildlife management before moving to Brazil to do his PhD on Jaguar ecology and conservation in tropical rainforest areas of the Amazon, for the Aveiro University in Portugal. Nuno is very experienced in the cameratrapping of Neotropical carnivores. See list of publications. After succesfully obtaining his PhD, Nuno worked as a postdoc in a project on science communication and environmental education in the Maputo Natural History Museum, in Mozambique, Africa. This experience led to a deep interest in solving human-wildlife conflict issues and researching the human dimension of nature conservation. He is currently working on projects in which scientific research, citizen science and environmental education can be combined and as such effectively applied in nature conservation initiatives. Nuno has so far been instrumental in developing our new conservation project in Bolivia aimed at harmonizing the relationship between mammalian carnivores, the tropical rainforest and people, and initiating the challenge of rewilding and ecological sustainability in Bolivia, in partnership with Conservation International Bolivia and CIPA. We are glad to have Shekhar Kolipaka aboard as member on our board of international advisors and our prime connection and expert for the Indian subcontinent! Shekhar has been working on the Indian subcontinent for the last 12 years with a focus on finding solutions to conserve carnivores in human-dominated landscapes. He started working on the ecology and behavior of small carnivores like the wild cat in forest fringes. He then progressed to include large carnivores and their relationships with people in encroachment environments and with respect to dispersion of large carnivores from protected areas into the countryside; with particular reference to the growing human- tiger conflict. Shekhar is strongly in favor of an integrated approach, combining knowledge and novel insights in landscape ecology, socio-economics and nature conservation. Shekhar has written and published two unique books: a expert guide on the tracking of Indian wildlife and recently a first monograph on Caracals in India. Shekhar obtained a Master of Science degree in Environmental Sciences from the UKZN- University of KwaZulu Natal in South Africa, specializing in protected area management. He also obtained Master degree in natural resource management and wildlife sciences from the Indian Institute of Management and in international trade from the Symbiosis Institute of Management, both in India. He is currently applying for a PhD at the University of Leiden in the Netherlands. In November 2012 the Rewilding Foundation went on mission to Bolivia to set up shop for a new project with new partners. 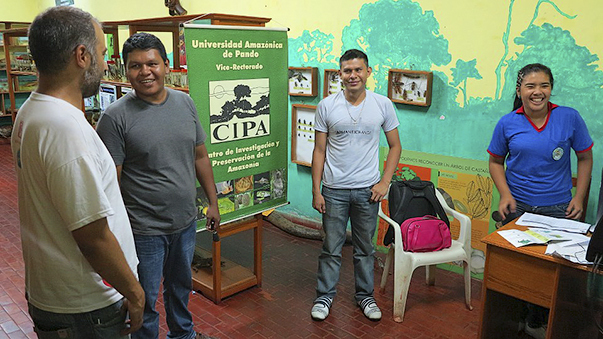 With a team of members from Aveiro University (Dr. Nuno Negrões from Portugal), Conservation International Bolivia, Centro de Investigación y Preservación de la Amazonia (CIPA) and Universidad Amazonica the Pando (UAP), an area in the district of Pando – in northwestern Bolivia – was explored. Paving the way for a new project! The goal here is to effectuate a project aimed at safeguarding a rainforest ecological network, improving the relationship between people and mammalian carnivores like the Jaguar, and protection of tropical forests for biodiversity conservation and climate change counteraction. The tropical rainforest in the Amazon is disappearing rapidly through deforestation and conversion to pasture for beef cattle and the cultivation of soy. In Pando, this process is lagging behind the alarming situation in for instance just across the border in Brasil, but is proceeding at an accelerating pace. This mainly due to the colonization and forestry policies of the Bolivian government, and largely poverty driven. Photo: E. van Maanen. The mission was very successful and consisted of visiting two areas in western Pando, a research reserve of CIPA (Tahuamanu Biological Station) and Manuripi Reserve, near the border of Peru and along the Madre de Dios River. The tropical lowland rainforests of Pando are barely studied ecologically, with exception of the Rapid Inventories by the Chicago Field Museum. From the booming settlement of Cobija, the exploration of the rainforest is proceeding according to the ‘classic’ herringbone pattern. A long straight road was cut through the rainforest allowing settlement by poor farmers (legal settlers and squatters) from all over Bolivia and from Brazil. On the land plot scale a farmer and his family occupy a piece of rainforest and remove it by logging and burning, to subsequently cultivate it (mostly with maize) until the nutrient poor soil is exhausted. Then another piece of forest is exploited later in time, as is allowed according to the current forestry and agriculture legislation. However, ambitious landlords tackle the land on a much larger scale, transforming forest into large open grasslands subsequently stocked with large herds of cattle. Trees are out, cattle comes in! Photo: E. van Maanen. 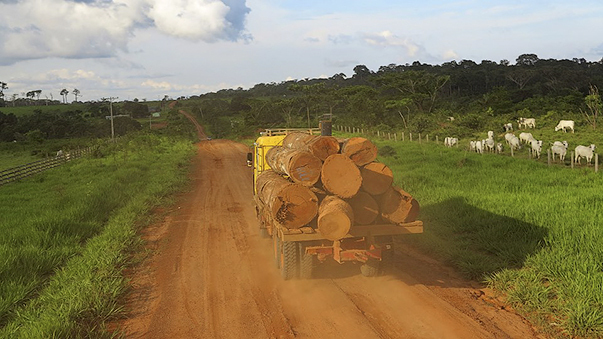 Tracts of preserved rainforest and former rubber extraction forests owned by landlords (called ‘Barracas’) are now largely used for the gathering of Brazil nuts, nowadays economically much more important than rubber exploitation. The giant Brazil nut trees need rainforest climate and certain animals (such as the Agouti) for their durable propagation. Many poor guest workers roam in the Barracas during the mast season early in the year to gather Brazil nuts. Loads of Brasil nuts are processed in Cobija for export. During our initial exploration of Pando we consulted villagers in the Manuripi Reserve on the Peruvian border about their relationship with large predators like the jaguar, puma and ocelot. We were welcomed and openly received to discuss the issue. Photo: E. van Maanen. Whilst collecting nuts the workers often shoot and catch a great many wild animals as bush meat, or perhaps partly sell alive on markets in the region or the international black market. Almost nothing is safe and much turns out to be edible, including for example the rare and majestic Harpy eagle. As a result of intense hunting many of the forest parts have become devoid of wildlife and virtually silent (this is called silent of empty forest syndrome), especially when compared to “pristine” tracts of rainforest, such as still exists in eastern Pando. Some species such as monkeys, tapir, peccari and large rodents as the agoutis and pacas play key roles in the rainforest, for instance as seed dispersers and pollinators. The biological diversity of the forests in Bolivia is impressive. Just a minute sample is shown here and further below. The Madidi rainforest south of Pando, for example, has been nominated as an area with the highest biodiversity on earth. From left to right: Two-striped forest-pitviper (Bothriopsis bilineata), a species of Anolis lizard, a rare Ringed woodpecker (Celeus torquatus) and a kind of tarantula. Photo’s: E. van Maanen. The Amazon rainforest has however been much influenced by Indian tribes in the past, as large parts were converted into forest gardens and a type of ‘park land’, centuries before the destructive Conquistadors appeared on the South American continent; the Pre-Columbian Era. In clear-cut areas in the region of Acre in Brazil for example, just north of Pando, this can be seen from the remains (geoglyphs) of impressive ancient settlements in the landscape. These transformed areas of forest actually gained biodiversity by a cyclic process of cultivation and abandonment. Hence the native people were apparently able to achieve and sustain a proper stewardship of the rainforest with biological enrichment as a result. This type of traditional land use may be useful as a model for the effectuation of ecologically sustainable use and management of the rainforest, as well as safeguarding a rainforest network in Bolivia for the conservation of biodiversity and for climate change counteraction. Pando is rich in Primates, including (left) the regionally occuring Brown titi monkey (Callicebus brunneus blonging to the Cupreus clade; pers. comm. 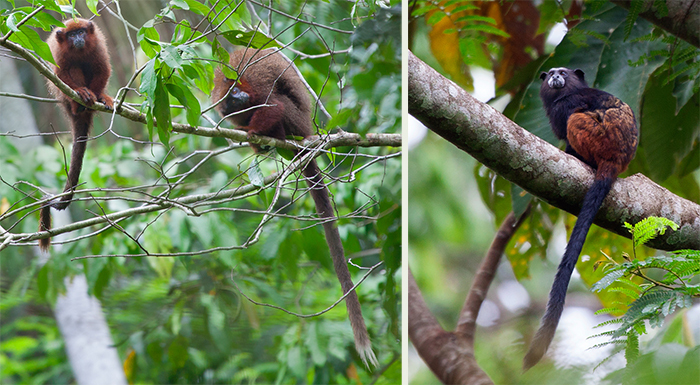 Marc van Roosmalen) and (right) the Saddle-back tamarin (Sanguinus fuscicollis weddelli). Photo’s: E. van Maanen. 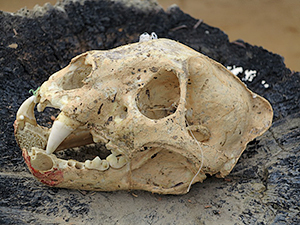 Skull of a jaguar shot in the Manuripi Reserve as a preventive measure to “protect the children”. Photo: E. van Maanen. Other animals with an important ecological role in the rainforest are predators such as the Jaguar, Puma, Ocelot, the Bush dog and the Harpy eagle. Unfortunately, conflicts between mammalian carnivores, in particular the jaguar and people are on the increase. The big cats incidentally prey on calves and other small farm animals, as people and livestock encroach more and more into their habitat, and because natural prey due to overhunting by settlers and guest workers has declined. Jaguars, when encountered by riflemen, are shot without pardon, or hunted down with dogs by cattle rangers. People fear the big cats, while the jaguar very rarely attacks humans, and then in most cases in defense when cornered. Even within the Manuripi Reserve jaguars are persecuted. This is evident from the first conversations we had with villagers and the remains of jaguars that we examined. 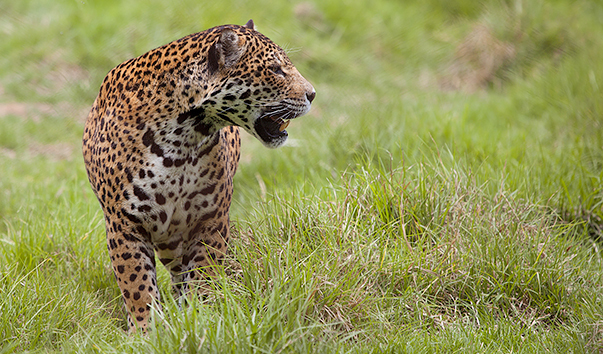 A jaguar has recently slain a calf. We discuss the loss with the owner over the bony remains, who at that time misses another calf. Unlike pumas, jaguars don’t cover their prey. Photo’s: E. van Maanen. The jaguar is an impressive and very powerful predator. In Bolivia, this big cat occurs in both the ‘normal’ spotted form (“El Tigre”) and as the melanistic or dark brown phase (‘Panthera’). The generally larger and apparently impressive black jaguar is regularly seen by local people in Pando, according to the people we interviewed. Left to right: Brown agouti (Dasyprocta variegata), Silky short-tailed bat (Carollia brevicauda), Plumbeous kite (Ictinia plumbea), Pendula lobster claw (Heliconia rostrata) and an Idomeneus giant owl (Caligo idomeneus). Photo’s: E. van Maanen. A pilot project is first of all set up to investigate the level of conflict between predators and local people, and to subsequently alleviate the conflict through consultation of village people and by way of involving them in a survey of mammalian carnivores and other biodiversity in the region. Workshops will be carried out by international experts in this field, and will involve a training of trainers approach. The Manuripi Reserve lends itself for a variety of practical and logistical reasons as a suitable demonstration and study area for a human-carnivore conflict resolution initiative. We envisage a citizen science and rainforest school project using tools like cameratraps and involving adults and children alike in learning more about the important role of the rainforest for our planet. Education, outreach and adaptive management are central components of the project. The enthusiastic and knowledgeable staff of CIPA – UAP in Cobija will be instrumental in achieving these objectives. Ultimately we like to solve the silent forest syndrome problem and instill ways to ecologically use and manage the rainforest, perhaps using the age-old stewardship of the original human inhabitants of the Amazon. Building on the succes and a good evaluation of the pilot project, a more encompassing project will then target the achievement of ecological sustainability, through the improvement of people livelihoods and a commitment from local people and authorities to safeguard the rainforest and its biodiversity. A search for large carnivores and other species deep in the tropical rainforest of Pando with the nature and survival skilled members of CIPA. Photo: E. van Maanen. The pilot will also serve as an investigation for the safeguarding of an ecological network, incorporating other remaining forest areas in Bolivia (in the district of Beni and the forest of Madidi), in Peru (Manu) and in Brazil (remaining forest in southwestern Acre). A visit to the Natural History Museum of CIPA in Cobija. Nuno Negroes having a friendly chat with our possible future project partners. Photo: E. van Maanen. 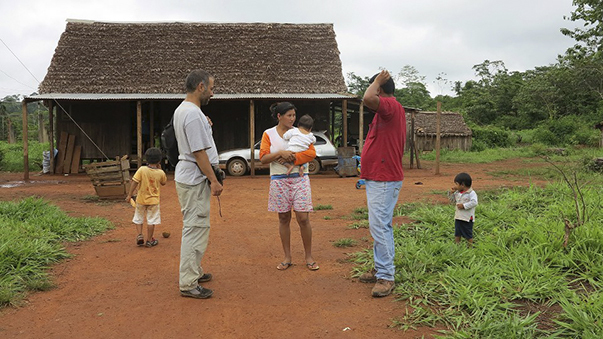 Despite the strong driving factors for the destruction and degradation of the rainforest such as poverty, the meat industry and the current Bolivian forestry policy aimed at claiming land, the team had a strong feeling that Pando and her amicable and ethnically diverse people lends itself to a gradual but viable process for change to ecologically sustainable use of the rainforest. However, we are acutely aware that this can not be achieved without improving the lives and welfare of the local people, possibly in collaboration with other organizations, which may include companies. Working in the rainforest is not without dangers. Here our Landcruiser was ditched for a few hours after heavy rainfall that made the muddy road very slippery. We could have ended up in the river. The locals helped us out. Photo: E. van Maanen. 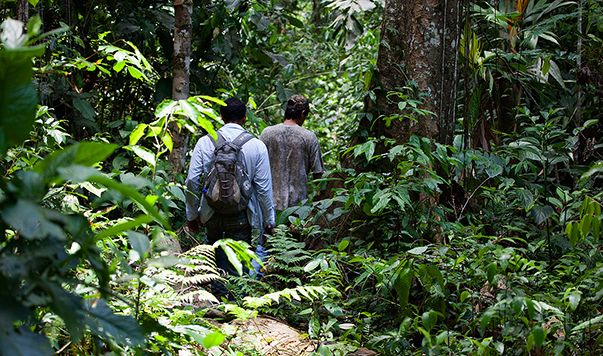 During our hikes of several days through the rainforest in western Pando we found the presence of many species. Impressive was the clear presence of the Jaguar, Puma, Margay, Tapir, Sloth, several monkey species and sizeable anacondas. We also saw many species of bird, herpetofauna and entomofauna. For example we recorded more than sixty species of butterfly. A nice comparison, on the excrement of a cow we found more species of butterfly than the number of species that still occur or persist in the Netherlands! The many faces of Pando! Beside biodiversity Pando also has a great cultural variety. This project is an initiative of Dr. Nuno Negrões of Aveiro University and Erwin van Maanen of EcoNatura and the Rewilding Foundation. The jaguar (Panthera onca) is a key species in the Amazone rainforest. This powerful cat rarely attacks people, but is regarded with fear and loathing by many, and often hunted mercilessly. Photo: E. van Maanen. 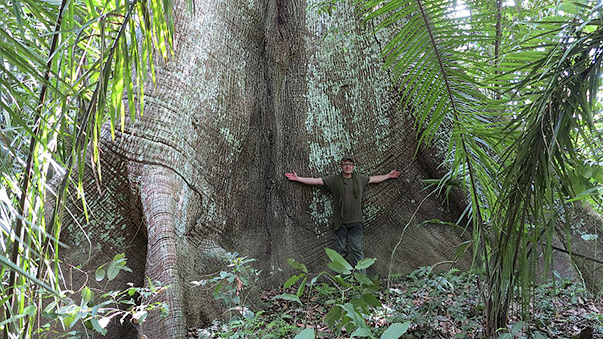 Erwin van Maanen of the Rewilding Foundation under a gigantic Kapok tree (Ceiba pentandra). When many people think of a red fox, they envision a cute, furry little creature that they occasionally glimpse traipsing across some suburban intersection. It’s true, red foxes occur nearly everywhere in North America, Europe, and Asia, in just about every habitat, including densely-populated urban areas. What many people don’t know about the red fox is that there are dozens of different sub-species (it is unclear exactly how many, but estimates top out at around 50) which range far and wide, from the deserts of southwest Asia to the mountains of North America. In fact, red foxes are the most widespread land carnivore in the world. The three sub-species of mountain red fox which occur in the U.S. (in the Cascades, Sierra Nevadas, and central Rockies) are adapted to the cold, harsh conditions of these high elevation areas, and appear not to mix with their low elevation-dwelling cousins. In light of this fact and considering the potentially devastating effects of climate warming (these foxes like it cold), questions have arisen about the future of the mountain red foxes. Enter PhD student Jocelyn Akins and the Cascades Carnivore Project (CCP). Since 2008, Jocelyn and fellow CCP researchers have been scouring southern Washington’s Cascade Mountains in an effort to document Cascade red foxes living in the area. While rambling in the high country in pursuit of red foxes (I alone traversed more than 200 up-and-down miles during my month on the fox crew), CCP researchers take the opportunity to collect valuable data on other carnivores, as well. Most notable among these is the mythical wilderness wanderer, the wolverine. Less is known about the wolverine than just about any other North American mammal, and given its affinity for rugged mountain landscapes, the wolverine has become an important piece of CCP’s research puzzle. Creatively employing a combination of camera traps, hair snaggers, and trail surveys, Jocelyn and her score of dedicated volunteers have had dozens of Cascade red fox and several wolverine detections in the mountains of southern Washington and northern Oregon over the past few years. As recently as ten years ago, wolverines were not even thought to exist as far south as southern Washington, while virtually nothing was known about the Cascade red fox. So, although many burning questions still remain to be answered, the CCP is off to a running start. Looking ahead, CCP researchers and fellow conservationists wonder if a resident wolverine population will re-establish itself in its historical range in the Lower 48 States. In the case of the Cascade red fox, we might wonder whether they will persist at all. With both the climate and the conservation landscape of the American West in continual flux, the fate of all montane species, and perhaps especially these montane carnivores, hangs tenuously in the balance. We can only hope that this storybook landscape, replete with snow-capped volcanoes, undulating forests, and under increasing human pressure, will be capable of providing the wilderness that these majestic creatures need in order to survive well into the future.